Home » Puzzle Games » Drop Me! Objective: Small colorful creatures need your help to reach the tube safely! 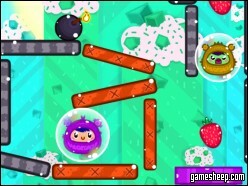 Pick the right moment to pop the bubbles in which the creatures are trapped so they can fall into the tube. Drop each character to their matching colorful destination and collect all the strawberries for a high score. Remove unwanted platforms from the way, use bombs and portals to move them to their final destination and watch out for the evil creatures. We are glad that you have chosen to play Drop Me! on GameSheep.com, the most dynamic website available. If you like this game Drop Me! don't forget to rate it and this way you will help with selecting only the best games for the home page.